What you think is alphabetical may not be as alphabetical as you think. 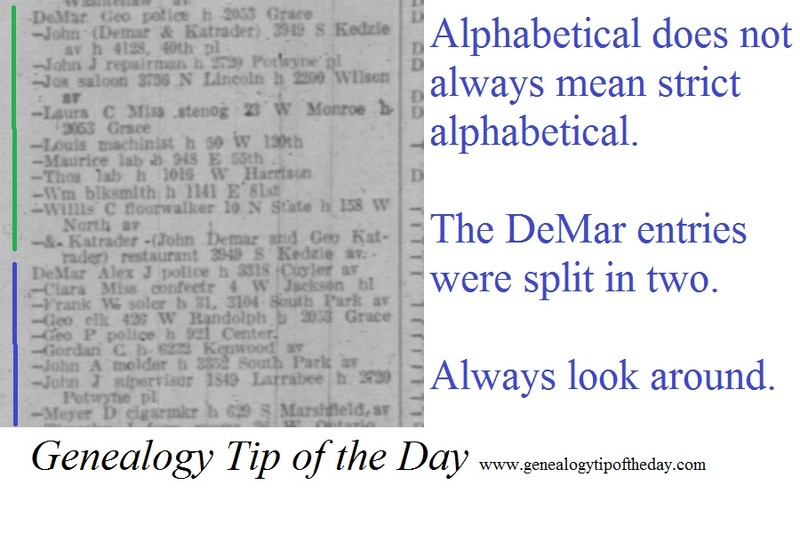 For some reason in this Chicago, Illinois, city directory the DeMar entries were split into two alphabetical sections. If I hadn’t “kept looking,” I might have missed the actual entry that I wanted. It’s always a good idea to do a little looking around in printed alphabetical materials for issues of this kind. Put yourself in the shoes of the person (or people) responsible for indexing and typesetting materials of this before computers. As a librarian, I would look through many pages to make sure my (or my patron’s) person wasn’t there. Good points. In this case, looking through all the “D”s to see where names with spaces would be advised. And even if it looks like the indexer was consistent, it’s always possible they weren’t, especially if city was large and likely had more than one person indexing and setting the type.